What causes layers in the sunrise and sunset? While it is stunning - and a bit eerie - to watch the earth’s shadow slowly blot out the moon during a lunar eclipse, we can actually see the earth’s shadow twice a day: in the eastern sky as the sun sets and in the western sky as the sun rises. 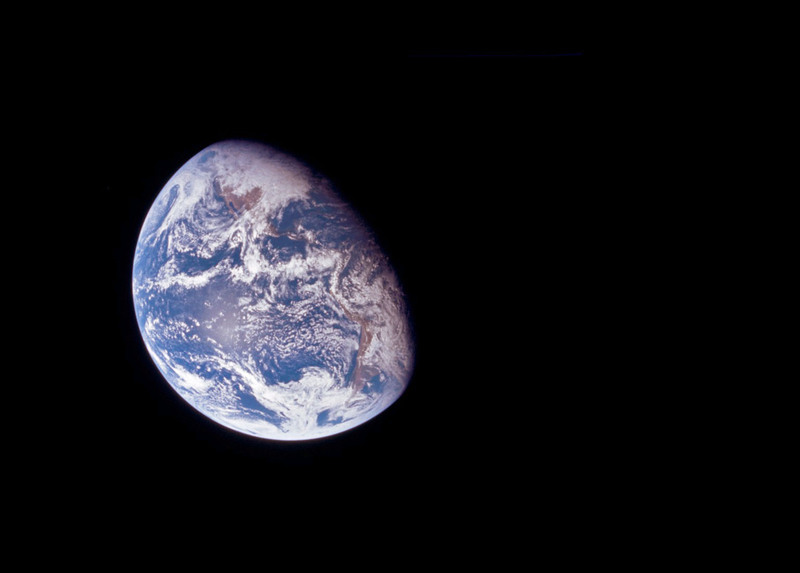 Earth shadow is cast by the earth, with the atmosphere as the backdrop. In this schematic view, the photographer is facing away from the sun, towards to sunset or sunrise. The earth’s shadow can be seen at twilight and sunrise most days, but it is not always blue. Earth shadow during sunrise, a half hour before sunrise in Kitt’s Peak, Arizona. At sunrise (7:15 am), the white arrow on the bottom is the shadow cast by Kitt’s Peak. 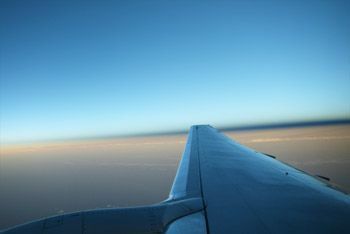 Earth shadow viewed from over the wing of an airplane in the Caribbean. The sun is setting to the left side of the photo. The dark wedge along the horizon, which thickens to the right, is the earth shadow. Just before sunset, a low, flat, dark blue band rises up from the eastern horizon. This is the earth’s shadow and it stretches for nearly 180°. It is bounded above by the pinkish antitwilight arch and below by the horizon. The earth’s shadow is best seen when the sky is clear and the line of sight is long. From a high elevation, the shadow appears sharper than it does from ground level. The sky’s strong color and brightness near sunset begin with small particles in the relatively thick lower atmosphere being illuminated by direct (reddened) sunlight. As the sun sets, the boundary between the earth’s shadow and the antitwilight arch rises in the sky and becomes progressively less distinct. As the boundary between the antitwilight arch and the earth’s shadow rises, it reaches an area where the atmosphere is thinner, and less red light is scattered. Eventually, only bluish light is scattered and only this blue light reaches our eyes. Ultimately, the antitwilight arch fades to blue, and the shadow blends smoothly with the deepening blue night sky. How can we see the earth’s shadow before sunset? Is it geometrically impossible? In fact, its dark bluish rim can be seen several minutes before the sun disappears. Just as a piece of cloudy glass is able to cast its shadow on itself, we can see the shadow of the translucent atmosphere cast on itself. 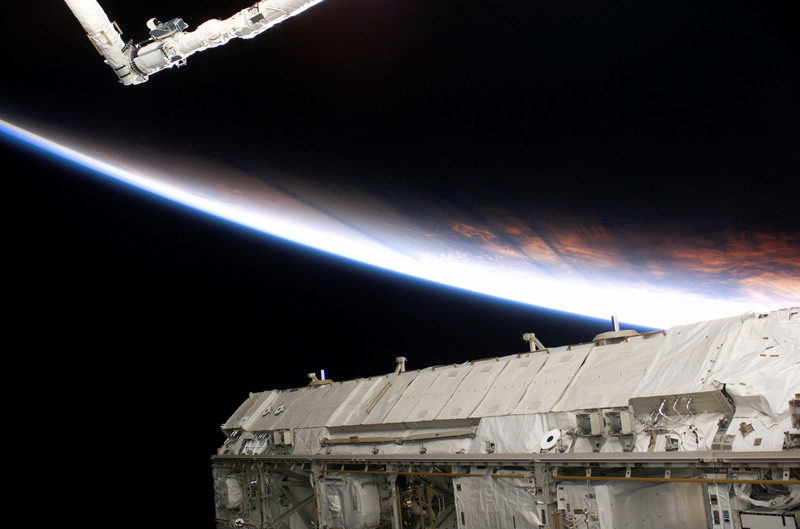 Warm pastels on the terminator between day and night, as viewed from space. 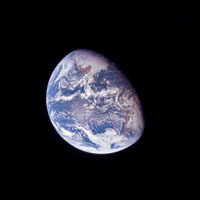 (A) Photograph from Apollo 8 astronauts during their lunar orbital mission in 1968. The sunset terminator separates the day side from the night side, crossing North America and South America. Clouds cover most of the United States. 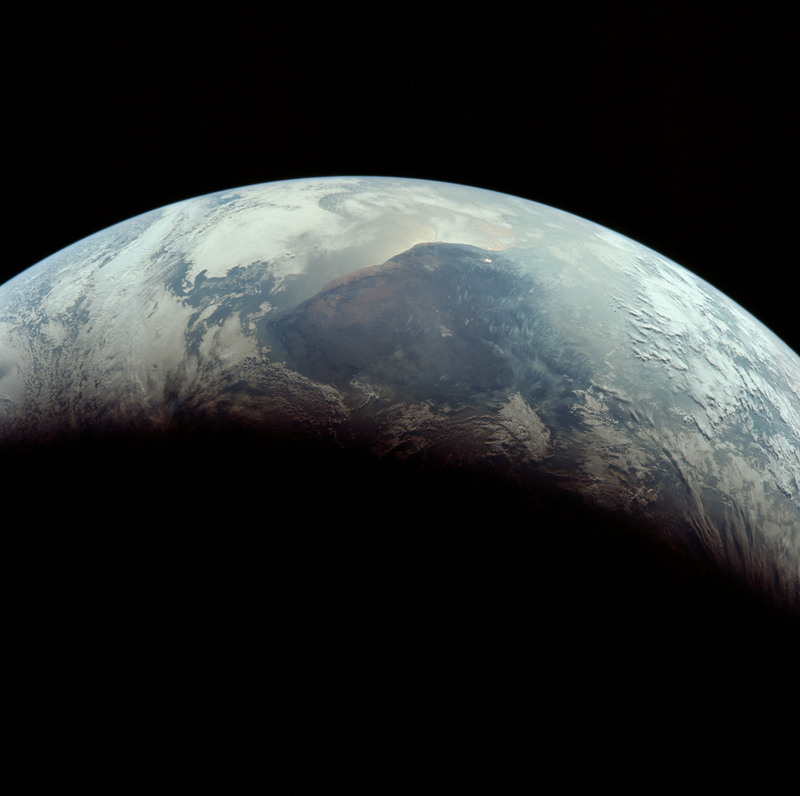 (B) A closer view of the terminator in this view from Apollo 11 in 1969 of Ethiopia and the Indian Ocean. 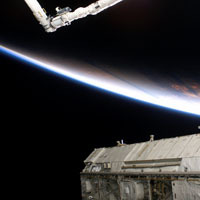 (C) An even closer view of the earth’s "limb" lit by the sun, from a lower orbit of the International Space Station STS-114 in 2005. A section of the station’s truss is visible on the bottom of the photo. You can see the blue of the earth’s atmosphere. Why does the sky overhead remain blue during the entire twilight sequence, when virtually every other part of the sky has changed color? We might expect the upper part of the sky to become pale when the sun’s illumination moves from sky overhead towards the horizon. Instead, although the sun is no longer shining through this part of the sky towards us, it remains blue. The earth’s stratospheric ozone layer is responsible for the blue color we see above us at sunset. Ozone absorbs strongly at longer wavelengths to filter out the reds, oranges, and yellows. This absorption has little effect on the color of the sky when the sun is high, when Rayleigh scattering dominates, but is at its greatest when the sun is close to the horizon. During this time, sunlight travels on its longest path through the ozone layer, leaving the sky above blue. Twilight is the time just after sunset and just before dawn, when the sun is below the horizon, but the sky is illuminated by refracted sunlight, or light scattered by the upper atmosphere. The twilight arch is an effect created by the sun, out of our line of sight, but still shining on the lower atmosphere. Its yellow color may turn reddish just before the twilight arch merges with the darker sky above.